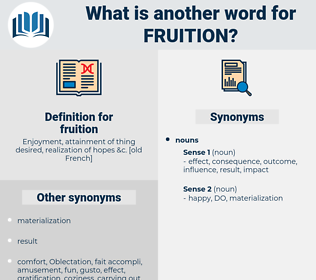 What is another word for fruition? fruit, realisation, completion, achievement, success, operationalization, accomplishment, outcome, outcomes, conclusion. disappointment, pain, unhappiness, misery, melancholy, depression, trouble, dismay, sorrow. 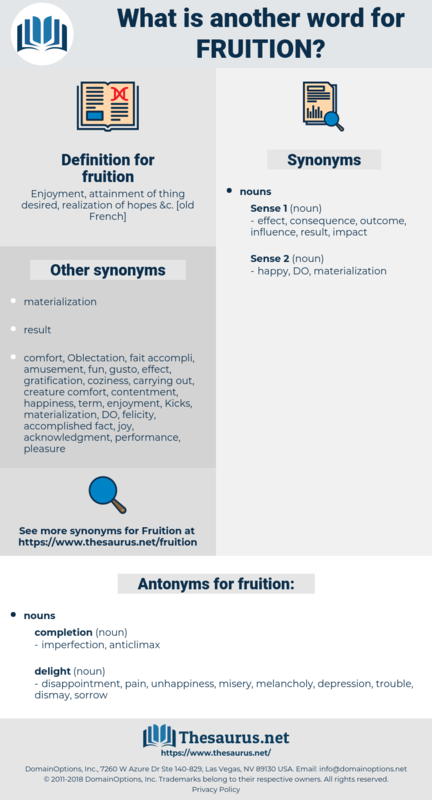 fizzle, Nonfulfillment, nonsuccess, naught, defeat. And all this vast, passionate love of mine is the strife of the soul for peace, for fruition. The fruition of life to him was in the completing of breeches, and its charm in a mutton - chop and a pipe of tobacco.